There are no shouts to view. The last few times I have been at home, a lot of my expenses have been eaten up by communication. Buying Areeba scratch cards every other day adds up. Almost every young person in Ghana has a mobile phone now which has aided communication a lot even though the costs involved are still quite high. In Comm centre, Castro Destroyer sings about a poor girl he met at the communication center and he loves her in spite of her poverty. Of course, the song is not about comm centers but what happened to the them? Have they been driven into obscurity by the emergence of cell phones? Castro (the Destroyer), a Takoradi native (wonngye) is one of the most loved hiplife artises due to his danceable tunes, and stage performances. He first burst onto the scene singing Sradenam (from the Damages album), which talks about women who entered relationships to enjoy the wealth of their partners and ultimately broke up with them. The women had to respond to Sradenam so Triple M made a song called Driver which advocated that women would not give their love to men who only used them (for the journey) and dumped them later (when they reached their destination). His second album had hit songs like Toffee, Boneshaker and Abongo Lorry. He's back again with Comm centre which also has tracks like Back and front, Mentumi, I promise, Fakye and Ma enye ho. Castro met this girl, who is a choirister, at the comm centre, and her father is a carpenter, but he still loves her all the same. Are the communication centers only serving the poor people/low class in Ghana these days? A few years back, comm centers were the business craze. They were stationed at every corner and it seemed to be the enterprise to pursue. Once, the 'space to space' phenomenon started, everybody joined that bandwagon and the comm centre craze died. Presently, the only reason I visit a comm centre or 'space to space' booth, is to buy a phone (scratch card) for Spacefon Areeba or some other phone service. I suppose communication centers, 'space to space', and phone booth are the cheap ways out to communicate, but when almost every Asumasi, Efo, Amalia and Naa have phones, these options are not very attractive. Wow, how the times have changed? The mobile phone cards are relatively cheap too. With the onset of transfer units, one can buy 'talk time' with about 20 thousand cedis. 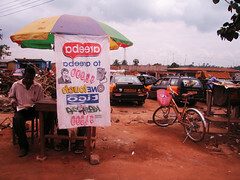 Ghana telecom's One touch and Tigo (formerly Mobitel and Buzz) sell their 'talk time' in cedis and are quite affordable. Access to phone cards is great, but the phone cards only go too far. 3 Areeba units gives a minute of talk time with another Areeba customer and calls to other services cost more. In effect, a 250 unit scratch card at the cost of 75,000 cedis gives you about 84 minutes. Compare this to a service provider in the US for instance. Don't say 'rip-off' just yet. Areeba has introduced free calls between 12:30 am and 5am, making insomniacs in Ghana very happy. There are also family plans, which allow cheaper rates to call loved ones, as well as the ability to 'flash' someone if you even have less than 3 units. The interesting thing is how Areeba continues to capture the bulk of the market. Their promotions and investment in marketing a few years ago have really paid off to the point that the 'cool' and 'chic' phone service to have is Areeba. Compound this with the fact that it is cheaper to make calls from one Areeba customer to another than to someone with a different service, one is doomed to get an Areeba chip since most of friends use it anyway. In the meantime, they have the worst network and instead of improving it, they are focusing on becoming more 'attractive' by sponsoring entertainment events and embarking on more promotions. Kasapa (good talk in Twi) has ridden its good talk, great value slogan for 3 years now and even though they have the best technology (CDMA - Code Division Multiple Access), they still have a small share of the market. They have 'ugly' phones and a customer base of market women to blame for that. The phone companies are doing well. However, we need to push them to give us better services and not take our business for a ride. If Areeba doesn't shape up, the market must hold them accountable and threathen to switch to Kasapa as a result. Ghana Telecom is not off the hook, Westel and Kasapa have started landline services and the bar for service is going to be raised. Maybe after MTN goes ahead and buys the parent company of Areeba/Scancom Ghana, the industry would get better. Ghana deserves much better and Ghanaians irrespective of class should be able to communicate affordably and easily. Scroll down to listen to song. I don't know much about phone technology but I don't think CDMA is the best technology out there. I think its an older technology. ma bad then. maybe there are newer and better technologies. From what I heard, Kasapa uses that and it's better than what the rest of the competition in Ghana uses. The destiny of a nation at any given time depends on the opinions (and actions) of its young men and women. CDMA is actually better technology for doing things like data transfer(like surfing on your phone) and even has fewer dropped calls. You could just say it's better than GSM (in fact W-CDMA was developed to replace GSM, see http://en.wikipedia.org/wiki/W-CDMA). It's just that GSM got deployed first in many more places. this very nice, thank you. Well Mobile phone is one of the best technology human being ever develop , and if we talk about GSM and CDMA,I think CDMA is best for the data transfer and in other ways, but at present there are more people using GSM then CDMA, even I am using a GSM in my old Used AT&T Cell Phones :), but it is a good one . ©2001-2008 THE GHANATHINK FOUNDATION, a free-thinkers association.